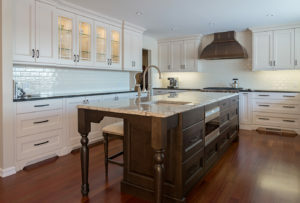 At Ekko Custom Cabinetry & Design, our designers often find themselves trying to guess the budget needs and design priorities of our customers. 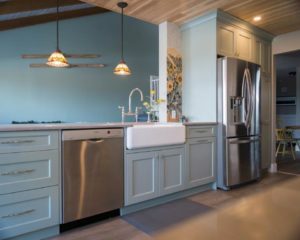 After reading a “revisited” article of “Most Popular Stories” in the September 2018 edition of “Houzz” by Moorea Hoffman (originally posted May 12, 2017), I decided to expand on that topic as it pertains to our experiences at Ekko Cabinetry and explore which trade offs to consider when remodeling your kitchen. The focus of this article was to have the renovating client consider all the options to be addressed in the planning stage. As you proceed through the renovation process from initial interest through more detailed concepts and selections, you will be best served by prioritizing your most important issues. 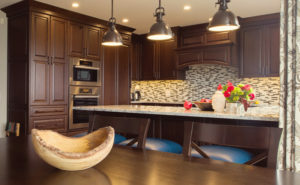 These issues will involve design, colours, various components, function and budget and relate to practically every detail of the renovation – cabinets, countertops, appliances, lighting, plumbing, flooring, paint, wall tile….. the list goes on. The more thought you give to critical features, budgets and design in the planning stage, the happier you will be with the outcome. The best place to start is to have a clear picture of your remodeling goals. The best way to get clarity on what matters most to you, read about some key trade-offs you and your Kitchen Designer will be considering and discussing during your project. You want to be very clear on how you want to use your new kitchen. Clear goals can help the homeowner make the best decisions for their project. As the budget nears its limit, choose the options that best support your goals – what matters most to you ! How Will You Use Your Kitchen – When planning a kitchen remodel , with a kitchen designer, you want to be very clear on how you want to use your new kitchen. For example, I want to do more entertaining (family or friends) and this will typically for groups of a dozen people …… or I want to be able to keep organized and tidy regardless of the number of people ….. or I expect several people to be involved in the cooking process during these events . Each of these priorities will call for a unique set of design directions. Clear design and function goals can help homeowners make correct decisions and, as the budget nears its limit, choose options that will best support those goals – what are your priorities ? Daily Use vs. Special Events – This area of consideration involves how many people your kitchen is able to serve and accommodate. From refrigerator size to seating capacity to the number of independent work stations …. each will affect your design choices. You’ll want to consider how many people live in the home now or how many will live in it 10 years from now. Also, how often do you expect to entertain and for how many people ? Consider whether you are the type of cook (person) who prefers to work alone or whether you would like to encourage regular interaction with family and friends …. entertaining in your kitchen. Whenever possible, we recommend that clients design with the average maximum capacity needs in mind. Cost vs. Value – AS you may have already discovered, if you are considering a remodel, everything from cabinets to appliances to sinks come at a wide variety of price points, features and styles. How do you decide when and whether to splurge for a high quality item or when it is more practical to stay on budget and save you money for more compelling items on your wish list. *Will this investment improve your everyday life ? *Will this product solve a pet peeve or address a daily need ? *Will the addition of this element make your house feel like a home ? *Will this purchase increase the value of your home ? Consider your choices as cost vs. value – in terms of your daily experience in your kitchen or the possible resale value of your home – you will gain clarity on what is worth the extra money. Analyze the frequency and duration of a given task. Tasks you do frequently or spend more time on should get more weight as you consider what and where to invest your money. For example, how big a deal is a high quality and efficient dishwasher in my routine or do I cook with burners or bake in an oven – each consideration will help determine the placement and quality of the product being contemplated. 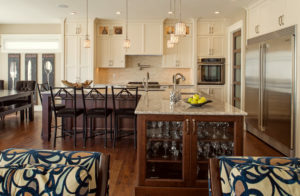 Function vs. Aesthetics – Ideally a kitchen redesign should address both beauty and function. However, when we are dealing with limited funds and space, trade-offs between functionality and aesthetics may be necessary. By function, we mean not only the “bells and whistles” you get with high end selections, but also the kitchen layout ( 1 sink or 2 sinks ? ) 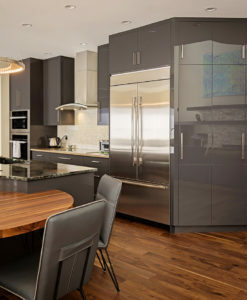 Aesthetics might include the more expensive but gorgeous finishes, customized detailing and exotic cabinet inserts that bring a high-end look and function to a kitchen. Unfortunately, a budget may force you to make choices on what matters most to you – the functionality or the look. These areas of trade-offs can be deeply personal and has much to do with your lifestyle. Consider everything we’ve mentioned earlier: how many people do you cook for daily, how often do you entertain, what type of entertaining do you generally do, what style of cooking do you prefer and / or how many people work in the kitchen at one time. There are many ways to compromise on aesthetics to create room in your budget for what is important to the functionality you want. 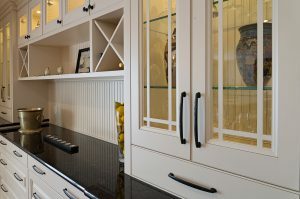 Ask the designers at Ekko Custom Cabinetry & Design to help you get everything on your priority list. Speed vs. Patience – Any home improvement project takes time. Once the kitchen is demolished and construction is underway, any delay can be difficult, particularly if you are living in the home …. and the mess. When you are living in the middle of that situation, you will be tempted to say yes to anything just to get the project completed and life back to normal. Please avoid these last minute compromises, in the end you will be much happier with your kitchen remodel and not as likely to have remorse for your compromises. When making a large financial investment that you are going to live with for a long time, GO SLOWLY – take the time to find the right people and weigh your decisions carefully. When making “speed vs. patience” decisions, consider how long you plan to live in your home. Always keep in mind, if the renovation has been rushed and done “on the cheap”, most buyers won’t give you any credit for the money and effort you have invested – they will simply add it to their “must be renovated” list – do it right or don’t do it !! !